With the Super Speak & line Texas Instruments introduced educational toys similar to the well known kids-computers with there small LCD-screens and ASCII-keyboards. From the technical aspect this Super Speak & Spell uses a standard voice synthesizer chip (TSP50C42) with an external Speech-ROM (TSP60C18) and some external components. Starting in 1991 the Super Speak & Spell used the TSP50C10 chip. A similar product was sold for math education, view the Super Speak & Math. 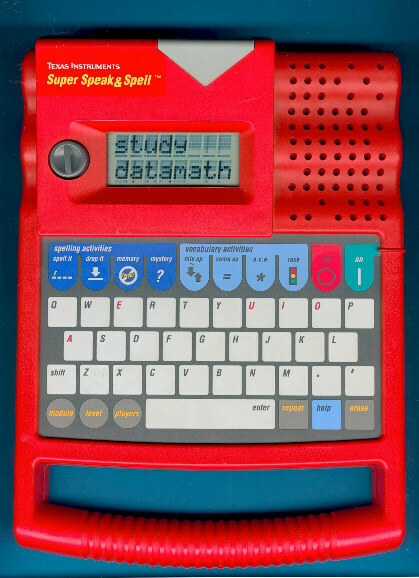 The Super Speak & Spell is the successor of the original Speak & Spell. Two years later with the Super Speak & Spell (91) a mixture of the original design and the modern electronics was born while customers in China enjoyed already in 1990 the "Professor". Dismantling a Super Speak & Spell manufactured in 1989 reveals a clean design based on a TSP50C42 Voice Synthesis Processor and an additional Speech-ROM TSP60C18. Very similar technology can be found in the Computer Fun, Mouse Computer and the Touch & Discover. Words, Words, Words 150 Expands spell vocabulary by 150 hard to spell words. Words Around Us 150 Increases vocubulary by 150 specialized words. Topics include sports, geography and food words. The Super Speak & Spell is featured in the Texas Instruments Incorporated leaflet Follow the Learning Path™ dated 1991.